Not everyone sits down and creates a quilt start to finish. Some of us like to work on multiple quilts and by doing several at a time, we find ourselves more entertained, albeit a bit crazy at times as we divide our time between several projects. 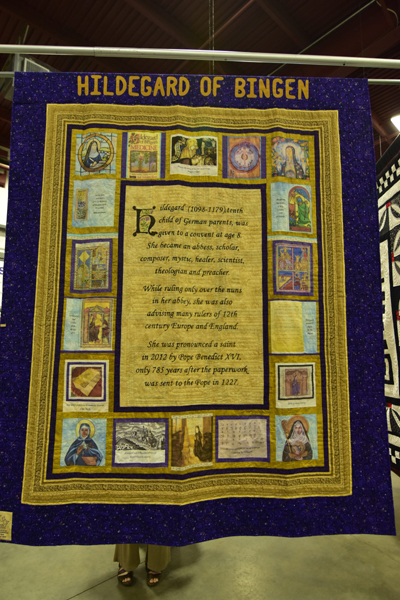 I was so pleased to have met and talked with Connie Harris Farrington from Queensbury, N.Y. last year at The Vermont Quilt Festival 2017, to discover that I am not alone in preferring to work on multiple projects at a time versus just one. Connie shared with me that she always has several quilts going at a time and filled me in on her process. First let me tell you about Connie's quilts. They usually always make a statement regarding women's issues. 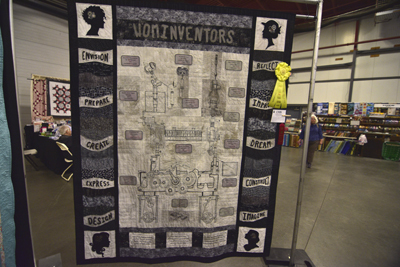 This years quilt, Wominventors was not different. Her quilts have something to say, and are usually dual sided. On the front of Wominventors, she shared the attributes of women inventors that make them so creative, along with her version of a rather complex invention! On the other side she shared cartoon women venting. Her humor is always evident as she shows both sides of an issue on each side of her quilts. Her quilts are show stoppers. Not only does she win ribbons for their originality and excellent stitching, but we all learn something from them and get a chance to smile at ourselves as women. 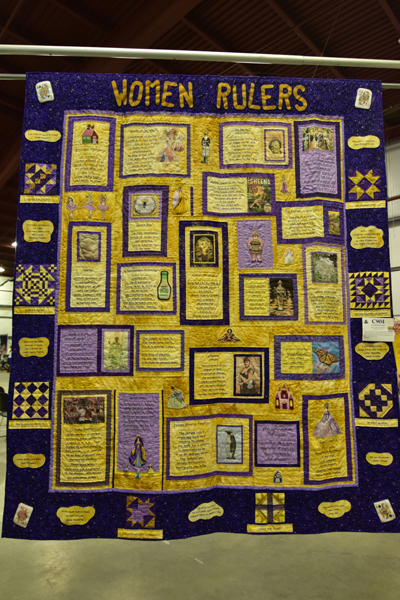 She finds what is common to us all and her quilts have a way of unifying our gender! They are clever and artistic, but also very well "researched" and executed to perfection. She shared her process with me, and helped me to accept myself and my quirks about how I work to create my own quilts. She is a natural teacher having explored her own style of how she works to make her quilts and her work is truly about "elevating women", all kinds! wisdom regarding quilting has changed my life forever! that one, so I didn't! "when Sears creates a riding vacuum, I'll clean house!" we do, and it makes us mentally very healthy people!! I am not the only one with quilts unfinished. Quilters call them UFOs or unfinished objects and most of us have several stored, in waiting of completion. Many of us live with guilt as we start yet another quilt without finishing our UFOs, but this is where Connie sharing her wisdom, changed my life forever. "Some quilts", Connie says, "aren't meant to be finished." We have learned what we needed to learn from them and it is time for us to move on. "So don't finish them", she says and then added, "if a relative really loves one of these, let your relative finish it! Work on the ones that you want to finish!" She also told me that some of her quilts are in the brainstorming stage and in her case, writing stage, where she continues to explore their message, and takes notes. She even carries paper and pen in the car or other places as her brain processes as she drives or does other activities. Others are in the designing stage as she makes her own pattern and coordinates the fronts with the backs. Some are in the planning stage where she collects all she will need to actually create the quilt, and others are in the execution stage where she sews on them and finishes the ones she wants to finish. 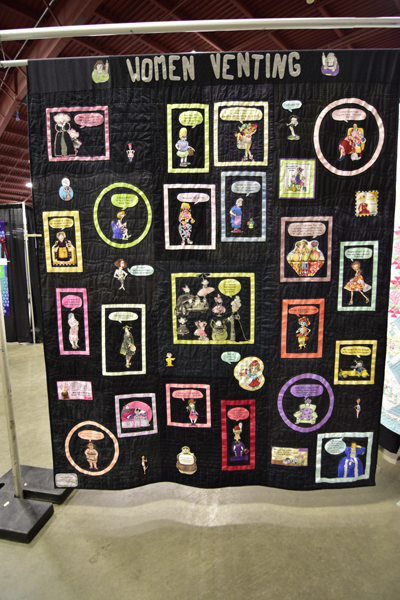 She has produced a quilt for every show since I have been attending them, since 2006, though sadly my husband wasn't photographing all the quilts then. Mind you, I don't remember that her stages are as precise as I have made them, as when she explained to me how she does what she does, she talks about her process in a more fluid way. I am simple and so these arbitrary stages are needed for me to better understand her process and incorporate much of it for my own. I am but an infant when it comes to multi-tasking, especially in regards to making quilts and so delineating the various stages helped me move many of my quilts out of what I had called my "stuck stage". There is a lot that goes into making a quilt and with my original quilts, I need pauses to problem solve and move them into the next stage, as I am not one that has planned all the separate tasks to execute the quilt I have created in my mind. Processing is needed with quilts that aren't made from patterns and more than once I have needed a pause for additional designing in order to move them to the next stage. As they grow and get bigger, I often find myself overwhelmed, when all that is really needed is to take a deep breath and take on the next challenge. I am learning that sewing experience counts and just needs to be applied in order to take your quilt through the various stages until they are completed. Connie did point out that when a quilt stops teaching you, perhaps they have served their purpose and as Connie suggests, it may be OK to lay the quilt aside and NOT finish it! I was appalled, but soon got over it. How many of us get sick of what we are working on, or are tempted to take short cuts and breaks might serve a useful purpose of helping us decide whether or not they are worthy of the time needed to complete them in the way we had envisioned. Her bits of wisdom applied to quilt-making has made all the difference! Another bit of wisdom came to me when I was shopping an estate sale. I was joking, but serious too, when I told someone at the sale that I planned to cut up all my fabric before I died. This was not a kind thing to say to someone that had just put her sweat and toil into organizing a friend's sewing wares after she died, so as to put together a wonderful estate sale. She turned to me and in all earnestness said, "then you must leave all of the project together with directions, for the person that acquires it after you, as it will save your relatives or friends much sweat and toil organizing your estate sale!" This was coming out of the mouth of an expert organizer and I took note! I really am not unkind and want my beloved sewing projects to get finished by relatives or friends should I die in the middle of them! I hope that whoever gets them will enjoy them when I leave this earth, and as one of my friends says, our deaths are not a question of if but when! I needed to appreciate that even estate sales need to be organized and leaving my sewing stuffs (enough to fill a house) in some sort of good order is the least I can do for my surviving relatives! I want to treat my loved ones with respect! This bit of information has also been a "freeing" bit. I may well not finish all my projects before I die, and as long as the materials for the project are collected and organized, there is no fear of leaving them to someone else! Now every project bin or basket has the pattern directions in a plastic sleeve tucked in with the project and fabric to take it to its completion. The person acquiring it doesn't have to stick to what I am doing but will have some idea of how the project was started and what I had in mind if they care to finish it as planned and have the materials needed to complete it, minus the batting. It also serves as an excellent way to keep bits of notes together for myself to help me return to a project that I may want to finish at a later date when all recollection of what I was doing has long faded from my memory, and as I age my memory fails me with regularity! I no longer live in guilt or pressure about finishing my quilts. Some are meant for me to finish and others for someone else, if they choose. All my projects serve a bigger purpose of teaching me a new skill. Life is short and getting shorter all the time. I am focused now on enjoying what I am doing. If something is of value, I will finish it and in this year's sewing goals, I am scheduling time to finish a UFO that I have long wanted to see done. I will do the same in the years that follow, but will also allow myself to create new projects and not stifle my creativity to stick to only to old, unfinished projects. I am also appreciating that many quilters now have someone else quilt and edge their tops and for money, I can do the same if I choose, or my relatives may opt to if I don't. My sewing is rarely about needing quilts or pincushions, but rather about the fun of creating them, and the sheer joy of sewing on different materials and creating designs as well as collecting beautiful fabrics. It is all good...and when treated as such, my projects cease to be dreaded activities that I am not in the mood for, but rather I do as I can with what I want, and as long as I leave them each in good order, may well become a project that someone else will value and finish! I will remember to put a copy of this blog in with my will as I want my children to sell or give whatever project to those that would appreciate them, and keep only what they like, might finish or have finished, but certainly not be under pressure to keep what they don't want. All is of value to someone, and for me, it has offered its pleasure, whether by collecting it's fabric, planning, cutting it, sewing it either partially or completely. It has been loved and useful in my life...So relax about your UFO's! When it is time to finish them, you will or you won't and either way, it is good! Connie Harris Farington, Queensbury, NY. me better enjoy my quilting process! Labels: Connie Harris Farrington, expert quilter and teacher.